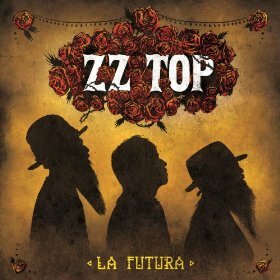 A distorted Billy Gibbons guitar, up-front Frank Beard drums and that usual low growl bass from Dusty Hill (plus his precise, slightly off-time backing vocals) are present in usual ZZ Top style on the remake of a hip hop classic, “I Gotsta to Get Paid,” the opening tune of the band’s first full-length album in nine years, La Futura. “I Don’t Wanna Lose, Lose, You” is very much like the opening tune, rolling a little more than chunking. I just love the torchy “Over You,” but then again I am quite a fan of ZZ’s ballads (my all-time favorite of theirs is “Rough Boy”), though it might go on a little longer then need be. The later and louder ballad, “It’s Too Easy Manana,” is better and features a great echo guitar lead from Gibbons. It might be Gibbons having to find his way round James Harman’s killer harmonica playing on “Heartache in Blue” that really makes this tune one of the best here, though the ending comes to a weird stop. I love the openness, high-hat splash strut of “Flyin’ High,” which could be an Eagles tune with backing vocals from Hill (this really is probably the most commercial song of these ten). Sometime hip-hop producer Rick Rubin was on hand for La Futura, but all he said he wanted was to see this trio get in a room and play, which they certainly do on this new album.